Prior proper planning prevents poor performance! Our productivity is greatly increased when we make the time to prepare. Notice I didn’t say ‘find” time. Preparation is a discipline and successful professionals make the time. Preparation is even more important in a changing economy. And we need to change our strategy during this time. What worked yesterday may not work today. 1. Who you are meeting with. In the overall sale, is this person the only person you should be meeting with? Are there others within this organization that should be included in the discussion? For this person, what is happening with them today? How is the economy affecting them personally? As you consider how to approach them identify a question or two that is just about them! 2. The industry they are in. Conduct research on the Internet to find out what is happening specifically in this industry today. Are lines of credit to this industry lessened? Does the global implication matter to them? These are all starting places. 3. The company. Have they had layoffs? Are they hiring? What is happening with their stock (if applicable)? What is their competition doing? There are many companies have found a way to capitalize on the financial situation in the US. 4. Review notes from past contacts. What level of discussion have you had? Has it been strategic – tied into increasing results, decreasing costs or lessening risks? Or tactical – focused on one specific piece of information that is tied directly to what you offer? Prepare to broaden your discussion to strategy and help them solve business problems or create opportunities. 1. Google alerts. Use these to receive an email when a specific industry, company, or person is in the news. Go to http://www.google.com/alerts to set your alerts. 2. Use your in-house CRM system – Garbage in, garbage out. If you have input good information, now is the time to use it! If you haven’t, set aside 30 minutes a day to populate your system. 3. Put pen to paper! Writing your call objective, questions you will ask, benefit you can crate and problems you can solve will help you retain focus during the discussion. The biggest obstacle to preparation I hear is the “not enough” excuse. Not enough time, not enough information, not enough value in doing it. 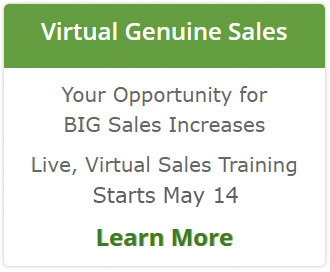 In our control studies, the sales professionals that prepared were 17-25% more effective than those that didn’t. How would those productivity increases impact you?